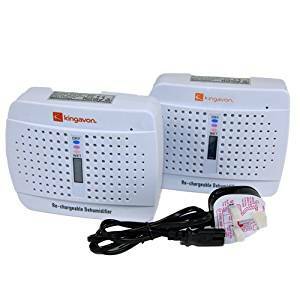 These rechargeable dehumidifiers from Kingavon come as a two pack and are great for addressing dampness issues on window sills, in wardrobes, on car dashboards or in camper vans or caravans. 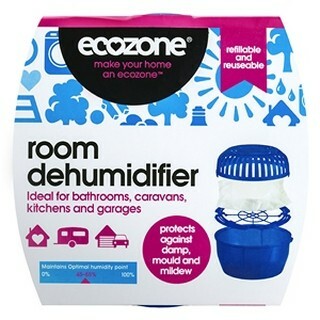 Each dehumidifier contain 350g of silica gel which will gather moisture from the surrounding area to protect against dampness. They come complete with hanging hooks for easy placement in a suitable location. Each pack also includes a recharging cable with a standard 3 pin 230V plug. 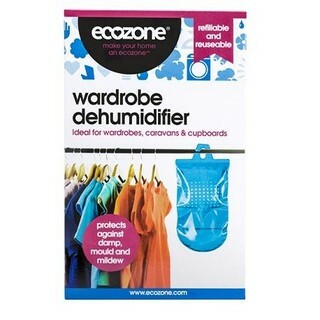 The rechargeable dehumidifiers have an easy to read colour coded indicator on the face of the product. When the silica gel is dry include and able to take in moisture the indicator will show a blue colour. When the silica gel has taken in all the moisture it can it will show a pink colour. At this point the dehumidifier needs to be recharged. A CE approved product, generally speaking each pack should last about 1 month at a time before it will need to be recharged. Obviously this depends on the volume of air & the amount of moisture in the atmosphere. When the indicator window is blue place the unit in a suitable location. It will take in moisture from the surrounding area and it will increase in weight as it gathers the moisture. When the unit is full, the indicator window will become pink. Plug the unit in and recharge overnight or until the indicator window returns to blue and it will be ready to use again.